Quillwork typically involves softening and dyeing porcupine quills, and then weaving them into materials like leather and birch bark. 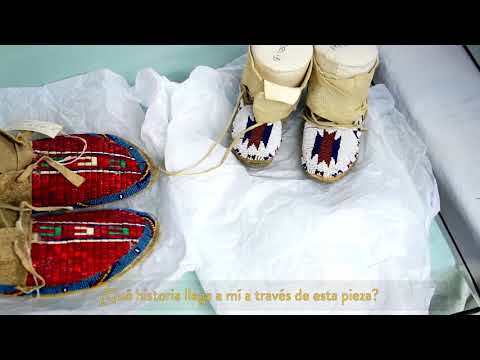 Chippewa and Micmac artists are best known for keeping the technique of quillwork alive, as other groups have turned primarily to beadwork, due to the difficulty of working quills. When sewing with quills, each end of a softened quill is inserted into the perforated surface. As the quill dries, it stiffens into place. Quills are either set parallel or crisscrossed to achieve different geometric shapes and patterns. Micmac artists use birch bark to construct many things, including houses, canoes, baskets, serving dishes, fans, and other objects. Birch bark is ideal for quillwork due to the layered characteristic of the bark. The bark is peeled away from the tree and, depending on the age of the tree, heated until the wood becomes flexible and can be perforated by an awl (a sharp tool that can be used to punch holes in different materials). One design commonly found on Micmac quill boxes is the eight-point star. Seven of the points represent the seven Micmac regions in Southeastern Canada and Northwestern Maine, while the eighth point signifies Great Britain. It was added to the design after treaties were signed between the Micmac and British Crown. This is a box made from birch bark and porcupine quills. This box was made by a citizen of the Micmac tribe. The Micmac community (also known as Mi’kmaq) is comprised of seven districts, ranging from the Northeastern US to Southwestern Canada. Micmac is also translated as “my kin; my friends.” Due to their artists’ skill in quillwork, the Micmac have also been referred to as “porcupine people.” The date that this box was made is not known, but it has been in Denver Art Museum’s collection since 1936. This box displays a variety of geometric patterning and earthy colors; the detail and precision are still evident. Micmac artists are particularly known for creating items with elaborate quillwork and for using a variety of bark types, such as maple, cedar, and white birch. Quillwork is commonly found on boxes made with birch bark. While we do not know what this specific box was used for, boxes like this are generally made for decorative purposes and for sale to tourists. Since incorporating quills is a long process and the resulting design can be fragile, items for everyday clothes typically do not include quillwork. Look closely at this object. Describe what you see. What do you think it would feel like? Think about how this object was made. What materials do you think the artist used to make this object? Can you find any familiar shapes on this object? Find inspiration for class artmaking related to the Weaver with Loom figure. Watch Melanie Yazzie discuss her inspiration, too. Students will work collaboratively to research and respond to the use of symbols in the Eyedazzler Blanket/Rug and what those symbols can tell us about the history of the people and the artist who created it. Artist Melanie Yazzie was inspired by the celebration and unity that story telling provides. The artist Melanie Yazzie was inspired by the intricate and unique designs that are significant to the owner as well as the parfleche’s function for holding important items.